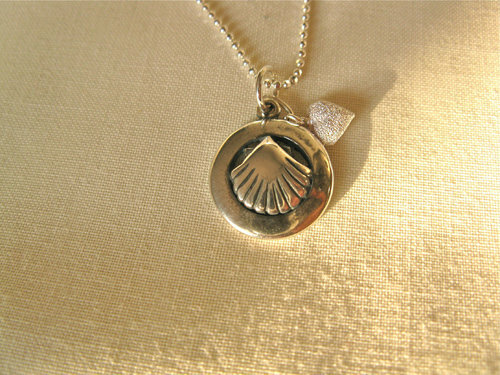 This sterling-silver necklace bears the symbolic scallop shell of the Camino de Santiago and nestling behind it is the cutest little stardust heart. Dimensions: The circular scallop shell charm measures 15mm in diameter and comes on an 18ins sterling silver diamond cut ball chain which sparkles in the light. 20ins length also available: Please choose in options box. There is a tiny little sterling-silver sparkly stardust heart nestling behind the scallop shell. Whatever somebody’s journey through life - whether on El Camino itself, or on holiday, a business trip, a gap year, trekking, etc, many friends and loved-ones like to pass on a special gift to wish the recipient well on their travels - and safekeeping along the way. This necklace is ideal and would be really appreciated. It conveys a mesaage that says "I care"
This scallop shell necklace with its tiny heart is the perfect present to wish someone a 'buen camino' / safe journey . . sent with all your love. Comes gift-wrapped, like all our presents - and we can print a personal message on your behalf.